It’s been nearly seven years since Daniel Radcliffe took off those round frames and said goodbye to Hogwarts forever. After eight films, and a decade of being synonymous with the titular chosen one, the actor said farewell to the wizarding world — seemingly for good. First he went dark in supernatural horror The Woman in Black, and followed up with an American accent as famed beat poet Allen Ginsberg in Kill Your Darlings. He dabbled in rom-coms with What If and even played a dead body in Swiss Army Man, while also returning to the stage in The Cripple of Inishmaan and recently, Rosencrantz and Guildenstern Are Dead. Long story short: Daniel Radcliffe is working hard to shed his Harry Potter persona. But while Radcliffe has spent the better part of the last decade transitioning away from Harry, another Harry Potter actor seems to be morphing into an alternate-reality Harry. 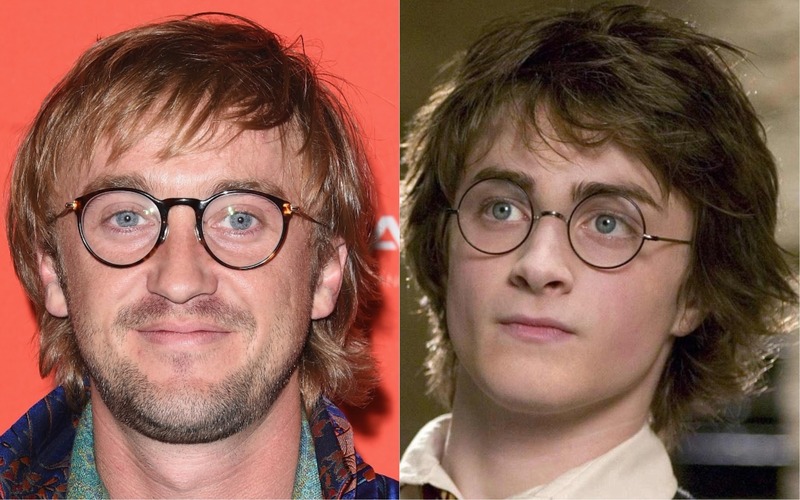 This realization recently hit us like a bludger to the face: Tom Felton looks like a hipster version of the boy who lived. Okay, stick with me on this. Now, when Felton appeared at the Harry Potter celebration in Orlando last spring (see above), we noticed something strange yet familiar about the actor. While most fans know that during his tenure as Draco Malfoy, Felton was a bottle blonde, dyeing his hair platinum blonde for all eight films in the franchise, he’s only just begun rocking the glasses over the last year or so. Naturally, he chose circular frames, and looks like the boy who got new glasses. But after stepping out at Sundance, it finally came to us like Homenum Revelio, because he has totally morphed into an older version of Goblet of Fire Harry. Jason Merritt/Getty Images; Warner Bros.
We can practically hear a chorus of people screaming, “You have your mother’s eyes.” Sure, he doesn’t have Harry’s iconic green eyes but neither did Daniel Radcliffe (we’re still upset). But if that uncanny side-by-side isn’t enough to convince you, at least admit that this ensemble — which we love by the way — definitely resembles a Muggle look put together by a wizard. And while Harry was raised by Muggles, this patterned mess of a scarf/jacket/cap combo is definitely something he’d find himself wearing at Christmas lunch to appease Mrs. Weasley, Ginny, and Fleur. Hermione would buy him a book. Felton’s Harry seems like it would combine the effortless swagger of Darren Criss’ Harry in A Very Potter Musical, and the scarf-loving confidence of Darren Aronofsky. This version of Harry and Ron probably go for a couple of pints with the Gryffindor boys every now and then and reminisce about the good old days in the boys dormitory – definitely leaving out all that Voldemort nonsense — or dope plays on the quidditch pitch. Hey, even Harry Potter had some glory days when you weed out all the very bad things that happened. Honestly though, we’d pay to see Felton star as a hipster Harry in an off-Broadway play — not that we’re sending it out into the universe or anything. But it certainly seems more likely that Sybill Trelawney begins regularly predicting the future than J.K. Rowling allowing that to happen. There’s always The Cursed Child. Still, we can sleep safely knowing that Voldemort is dead and Tom Felton continues to embody the spirit of Harry both mentally and physically.